The music of Gabriel Fauré is elusive in a number of ways. He shows a fondness for the 6/8 time signature, a rhythm that can feel either as if it is in 2 or 3. His training as a church musician shows in his modal harmonies, so the music seldom feels settled in a particular key. Although there is something unmistakably personal in its utterance, at the same time there is an ambiguity about it. This is particularly so in his later music, which is less melodic than his earlier style; the outer movements often present a continuous flow dominated by ostinato patterns. The piano Barcarolles were written between 1881 and 1921, covering most of Fauré’s creative life. As the name suggests they were inspired by Chopin’s wonderful Barcarolle, op. 60. Here and there one hears an echo of Chopin, but for the most part Fauré’s piano writing is not obviously derived from any other composer. He frequently resorts to an accompaniment in semiquavers to evoke the ripple of water. If one plays these works all at once this can become a little monotonous, so I would recommend playing them in groups of three or four. Charles Owen adopts fairly deliberate tempi for the most part, and his dynamics are restrained, in keeping with the intimate nature of the music. His right hand often has a sparkling quality, noticeable from the very first Barcarolle. 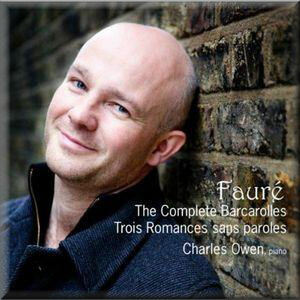 The melodies transfer effortlessly between the hands; this is an effect Fauré resorts to quite frequently, but is particularly evident in the sixth Barcarolle. The rapid scale passages in the right hand of the third Barcarolle are played with great fluency, without being merely decorative. The seventh Barcarolle marks the onset of Fauré’s later, more opaque style; this piece has a notable air of introspection. The eighth and eleventh Barcarolles are more extraverted, but most of the later pieces feature melodies that proceed by chromatic steps, rather like a crystal forming in a concentrated solution. Owen is unfailingly responsive to the subtle and unexpected nuances of this music. The disc is rounded out by the early Romances sans Paroles. These three pieces were written when Fauré was still a schoolboy, and show the influence of the Mendelssohn Songs Without Words. The gentle syncopation of the first Romance is well balanced against the melody. The third has a relaxed charm and shows Fauré’s fondness, even in his compositional infancy, for melodies that proceed by downward steps. The recording is very good. Jean-Philippe Collard’s 1990 compilation of the Barcarolles and Romances also includes the delightful Dolly suite, four Valses-caprices, a Mazurka, and the Souvenir de Bayreuth, based on themes from the Ring cycle. After Owen’s sensitivity I found Collard’s way with the music rather summary, and the repetitive character of the piano writing was more pronounced.